Do you scour through sites like IMDB, Rotten Tomatoes, etc to find a good movie to watch tonight? What if you could tell someone what kind of “movie mood” you are in and you got recommendations? Jinni is a whole new way to discover movies and TV shows. In the mood for fast or feel-good? Mind games or manhunts? Search for just that – while we learn your unique taste to recommend more titles. Read about the Movie Genome behind our novel technology. Jinni’s social search-and-recommendation engine uses our Movie Genome, a big, ongoing project with the Jinni community to describe video more complexly. Using proprietary technology, a Jinni search takes you inside plot elements, atmosphere, and more – for search that reflects how we think and talk about movies. After signing up for an account with Jinni, you would be best served to get familiar with the site tools. Also, Jinni gives out best recommendations once it knows you as well. Think Netflix recommendations based on movies you liked/disliked so far. Initially you could take these short quizzes called Taste Test in different areas – Introspector, Hero, Individualist, Drama Addict, Social Animal, Extremist, Alternate Realist, Escape Artist, Master Mind, Idealist, Strategist and Social Philosopher. Jinni will give you scores and base your movie recommendations based on that. Ok, searching and finding movies by genres, actors, directors, etc isn’t anything new and that’s not the reason I chose to review Jinni..
Jinni’s power lies in its intelligent search. Each movie in Jinni is also tagged by type of plot, mood of the film, type of viewer, etc. So, you could search for stuff like ‘romantic divorce movies’, ‘comedy action’, etc. You could filter the movies by mood, plot, genres, actors, time period, etc. too. Once you find a movie you can watch its trailer, add it to your wishlist, etc. Anotehr cool feature is the Netflix integration. You can connect Jinni to your Netflix account and add your Jinni movie recommendations straight to Netflix queue! If you found Netflix’s suggestions fall short, Jinni could supercharge that for you. Jinni is in private beta and I have 10 invites to give away. Just leave a comment with your email address and I will give away the 10 invites randomly by 5PM EST today. Your email address will not be used for anything other than to send you the invites. i just hope it is as good as u speak about it.If it actually works, it will solve the woes of finding the right movies..The whole process of scouring through IMDB and stuff is a painful affair. .-= Ankit´s last blog ..Loans To get Softer,SBI cuts lending rate by 0.25% =-. And BTW, have u reinstalled comment luv..it sure looks like tht..
.-= Ankit´s last blog ..The Best Explaination For The U.S Credit Crunch =-. Thanks for the great review of Jinni! We always welcome feedback as we work on developing and improving our beta service. 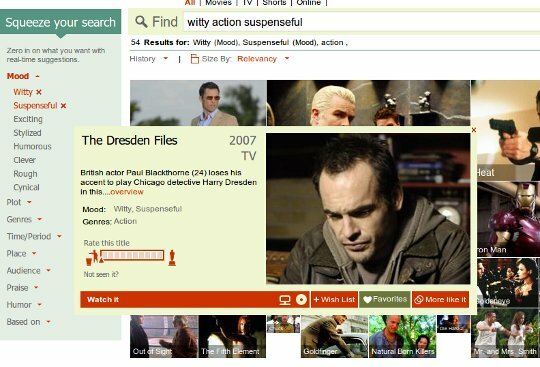 That is a good recommendation, it is really annoying to use IMBD, not because it isn’t a good, but because it is so slow as are a great many Internet sources for films and actors searches.